Farryl Purkiss, the highly rated South African singer-songwriter, recently completed a mini-SA tour with Luke Doucet and Melissa McClelland, the acclaimed Canadian husband and wife musical duo. If you are in Cape Town and you saw those concerts and want to get hold of any of Luke Doucet and Melissa McClelland’s CDs, then you can find them at Mabu Vinyl. We currently have in stock ‘Thumbelina’s One Night Stand’ and ‘Victoria Day’ by Melissa McClelland; and ‘Broken (and other rogue states) by Luke Doucet and ‘Bloods Too Rich’ by Luke Doucet and the White Falcon. the city centre that are among the few which still stock vinyl. The first stop was the recently revamped Hi Five in Kloof Street. Hi Five was opened by Kevin Phipson and Kurt George eight years ago and offers a wide range of collectable rock vinyl albums, among other genres. The store is visibly stocking a lot less vinyl since it re-opened, and store manager, Rob Scholtz, agreed that vinyl is “dying out”. But, he said, the store is currently attracting a different clientele. “Vinyls are definitely dying out due to all the software available for DJs, but the clientele is starting to change; we are starting to see more listeners come into the store as opposed to DJs,” he said. The second stop was a charming store in Rheede Street called Mabu Vinyl, which offers a wide range of second hand records at reasonable prices. Unlike the other stores visited by the CapeTowner, the majority of the stock at Mabu Vinyl was, in fact, vinyl and not CDs. The store first opened its doors eight years ago, said store manager, Stephen Segerman, when it operated out of the well-known Kloof Street bric-a-brac store Kloofmart. “Kloofmart was owned by Johan Vosloo and his son, Jacques Vosloo started the record shop in the back section,” Mr Segerman said. And who could ever forget the iconic corner that housed Mabu in those days, bursting at the seems with crates of records, windows plastered with flyers for various parties, and all types of music lovers popping in for a tune. Despite it’s new swanky location just off the must-be-seen-in Kloof Street, Mabu has maintained its charm and seems to have maintained its loyal clientele. The last stop was Soul II Soul records in Bree Street, formely known as Syndicate Records, which was started by Dino Michael almost 19 years ago. The store’s selection is mainly new records, including house, hip hop and old school music. They also run workshops, including the DJ school, where young aspiring DJs attend individual lessons conducted by Tony Smith. It’s been more than 20 years since the industry first started phasing out vinyl in favour of CDs, but there are still those who prefer the older medium. Unlike the abrupt and certain death suffered by cassette tapes, records have managed to maintain their popularity, perhaps because of their charm and – if your vinyl is in good condition – excellent sound quality. Still, for many reasons, portability high on the list, digital music is gaining popularity and it’s now, possible to carry hundreds of songs of a fairly decent quality on some thing as small as your little finger. So, while vinyl may have survived the CD revolution, it remains to be seen whether it will outlive the age of digital music. Rodriguez is currently one of the world’s biggest cult musicians with fans all over the world from New Zealand, Australia, South Africa, to UK and across the USA. However, it was not until 12 years ago, when he was rediscovered working on a building site by local journalists Stephen Segerman and Craig Bartholomew; did the songwriter and singer of “Sugar Man” and “I Wonder” realise that his defining album “Cold Fact” (1970) had become a cult classic and that he was a beacon of revolution for the people of South Africa. Rodriguez had completely turned his back on the music industry after his albums “Cold Fact” and “Coming From Reality” (1971) were unsuccessful. While his music career faded to little more than a memory in his life, Rodriguez lived an unobtrusive existence, unaware that his legend continued to grow in the Southern Hemisphere. “Cold Fact” became a word of mouth success especially amongst the youth in the South African armed forces that identified with his counter-cultural bent. Many thought Rodriguez was dead and his album went platinum in South Africa without him ever earning one cent. Today Rodriguez is spoken of in the same reverent tones as The Doors and Jimi Hendrix. 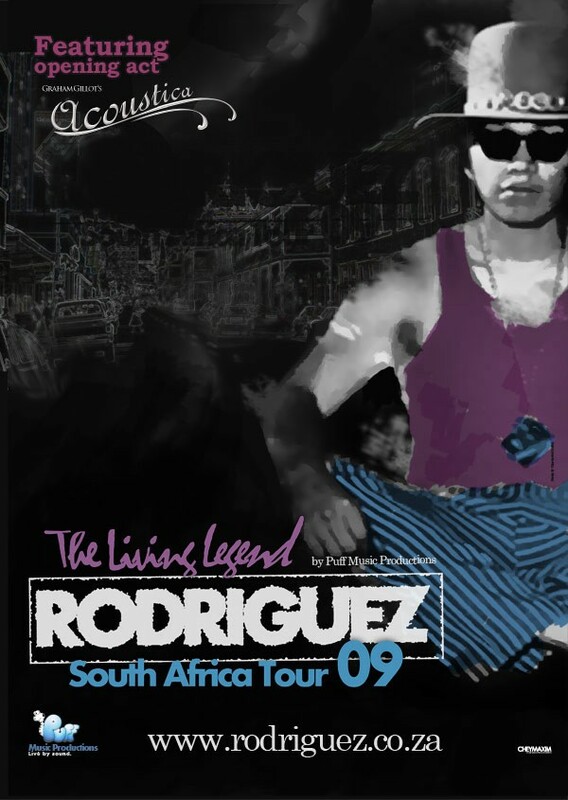 Since 1997, when he was “rediscovered”, Rodriguez returned to South Africa and Namibia four times and his albums have been released on CD worldwide. In 1998 Rodriguez featured in a television documentary “Dead Men Don’t Tour”. After more than 35 years it seems that the wheel of fortune is finally turning and Rodriguez’s fame is rapidly growing in his home town Detroit and throughout the USA. His albums have been re-released and there is a documentary movie being made about the “Sugarman” himself. Mabu Vinyl is the record, CD, DVD, cassette, book, comix and turntable store in Gardens, Cape Town, that was established in 2001 by Jacques Vosloo, who now co-owns it with Stephen Segerman. Mabu buys, sells and trades vinyl LP records and CD’s of all genres, as well as DVD’s, cassettes, books and comix, and has a large selection of Dance music, Hip Hop, House, Techno, Trance, Rock, Pop, Jazz, Soul, Funk, D&B, R&B and much more. Mabu is open 7 days a week….